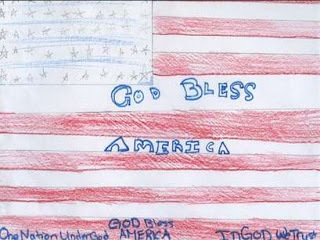 I'm haunted by the story of Taryn Hathaway, the 13-year-old Salinas, Calif., girl who reportedly was told by her art teacher at Gavilan View Middle School that her lovely drawing of the American flag with the words "God Bless America" inscribed on it was "offensive." The reason I say I'm "haunted" is because the story perfectly distills everything that is wrong with America today. Look at the picture Taryn drew. Is this remotely offensive in any conceivable way? Of course not. And yet, some people are indeed offended by the American flag, by God, by the Bible, by the Boy Scouts, by our soldiers, by tea partiers, by success itself – by everyone and everything that is decent and wholesome and noble in our country. Let's find out why. First, let's depart Salinas and survey the surrounding landscape. Just north, in Morgan Hill, Calif., we have the spectacle of five male students at Live Oak High School being kicked out for wearing tee-shirts with the American flag – clothing choices labeled "incendiary" by school officials in light of the day's Cinco de Mayo celebration. When they were told to turn their patriotic shirts inside-out or be suspended, the boys refused and were sent home. Southward, with Arizona lawmakers desperately trying to legislatively protect their state from being decimated by half a million illegal aliens and the appalling levels of kidnapping, drug trafficking, crime, cultural depravity and unbearable economic drain they've inflicted on the state, critics respond by condemning Arizonans as "Nazis." Yet those who accuse law-abiding Arizonans of "bigotry" and "apartheid" display a mystifying empathy toward the illegal aliens who violate our laws, some of whom arrogantly and defiantly demonstrate as though this was their country, and we Americans were the trespassers and criminals! What is this bizarre, topsy-turvy mentality taking hold in our country, which makes some of us rich in "compassion" for corruption, but viciously attack decency and reason? When Carrie Prejean had the courage and personal integrity to say on national TV (knowing full well it might cost her the Miss USA title – which it did) that she believes marriage should be between a man and a woman, many ridiculed her as a small-minded, fundamentalist bigot. But these same detractors are blithely tolerant when "gay rights" activists maliciously and blasphemously disrupt church services and terrorize parishioners to protest Christian "intolerance." "Tea partiers" – the multitudes of normal, everyday, hardworking Americans, grandmothers in wheelchairs with their homemade signs and soccer moms who pick up every bit of litter after demonstrating peacefully against the unprecedented outrages of an insane government – are recklessly characterized as bigots, racists and violence-prone extremists, without a shred of evidence. This malevolent attitude toward regular Americans permeates the Obama administration, as well as the Obama propaganda ministry formerly known as the mainstream media. Yet these same, harsh tea-party critics demonstrate unending magnanimity toward left-wing demonstrators who routinely employ vile, defamatory language and intimidating and downright violent and criminal behavior. Why, in America today, do an increasing number of us see good as evil, and evil as good? Some of us are twisted up as a result of having been either corrupted or indoctrinated. Whether we're seduced into sexual immorality, terribly spoiled by weak and insecure parents, tempted to hate and blame others for our problems and retreat into perpetual "victimhood," or indoctrinated by leftist professors into seductive but malignant ideologies like Marxism – the result is an automatic change in our values and worldview. Up becomes down and right becomes wrong. Obvious example: Say you're tempted to join a criminal gang: The police, once a benign and protective force in your life (when you were law-abiding) are now seen as enemies, while the drug-dealing gangbanger, once a predatory character to avoid, is now your friend and benefactor. More subtle and common example: You're a good kid who goes off to college, but you are seduced into sexual immorality. Whereas formerly you believed in God, the Ten Commandments and traditional morality, now that you've been tempted to cross over a great moral line, you magically see everything differently in this new realm: You're suddenly uncomfortable around those who still advocate the morality and common sense you left behind. Your attitudes toward abortion, homosexuality and all other moral/sexual issues have also "evolved"; you're more "tolerant" – toward other immoral people – but are strangely intolerant of those who remind you of the moral standards you left behind. We see this "sympathy for the devil" in Eric Holder's Justice Department, which excuses the menacing New Black Panther Party thugs who brazenly threatened Philadelphia voters with a nightstick on Election Day 2008. Widely considered the worst case of voter intimidation in modern history, Holder dropped the charges. He is even sufficiently sympathetic to terrorist monsters dredged off foreign battlefields to reward them with the constitutional rights properly meant for Americans. We see the same inexplicable resonance with America-hating terrorists in the establishment media's bizarre sympathy for Times Square terrorist Faisal Shahzad, as well as for virtually every previous terrorist or attempted terrorist to strike America in the last decade. I remember, right after the Sept. 11 attacks, another California school, Rocklin's Breen Elementary, erected a marquee-type sign to honor the 3,000 Americans killed, which simply said, "God Bless America." Offended by this, the ACLU threatened to sue the school for an "unconstitutional establishment of religion." You'd think, with all the problems we faced then – nameless, faceless, demonic enemies trying to blow us up by the thousands (problems that remain today) – that the ACLU might find more sinister enemies to fight than a grieving school proclaiming "God bless America." But you see, the ACLU – which conspires to remove memorial Christian crosses from the gravesites of heroic men who died for our freedoms – sympathizes with and defends evil and corruption, and is offended by goodness and godliness. If you don't get this, you don't understand what is destroying America. What we're talking about here is not political, cultural or even religious. It's spiritual. There is light and there is darkness in this world. And the darkness cannot stand the light. By the way, news reports say the 13-year-old flag girl's teacher – who deemed the "God Bless America" flag offensive – warmly approved of another student's picture of Barack Obama, who is currently dismantling America and everything that beautiful flag stands for. Still, you might well wonder, how could anybody be offended by a little girl drawing an American flag with "God Bless America" on it? Obviously I don't know this particular teacher's mind, but here are some possibilities: "'God Bless America' may offend atheists," or "We're in a public school, so this is a violation of the constitutional separation of church and state," or "America is pursuing immoral wars, so I'm offended by mindless flag-waving patriotism that leads to killing," and so on. Whatever the rationale, such mental babble serves only to cover up the underlying reality that the darkness that has wormed its way into us is offended by something noble, which makes the darkness feel uncomfortable. Of course, as I explain throughout "How Evil Works: Understanding and Overcoming the Destructive Forces That Are Transforming America," redemption is always available to all of us. If only we realized that just facing this inner darkness honestly and with total transparency – and believe me, there's some of it in all of us – is the equivalent to letting the light of God shine on it, driving it away. It's kind of like when you've wronged somebody but haven't yet had the courage to go to them and apologize. So you feel the conflict of it in your soul. But then, when you finally face the problem honestly and sincerely confess and apologize to the person you offended, the problem and the conflict vanish into thin air. You're clean, free, healed. It's over – almost like it never happened. That's the magic of repentance and confession and forgiveness. That's what I'm talking about here, except the one we've offended is not some other person. It's God. And He's not even looking for an apology – not in words, anyway. He just wants us to stop running away from Him into the velvety darkness of pride and anger, where good seems evil and evil seems good.